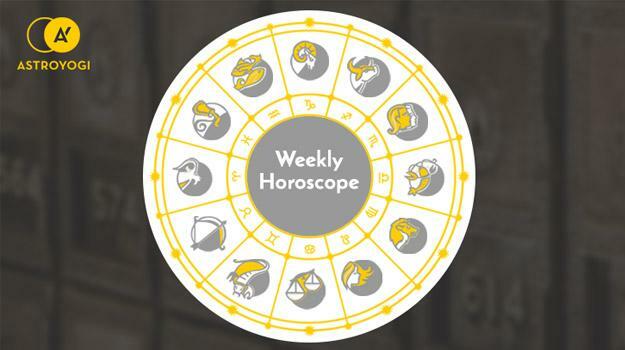 Your weekly horoscope (21st May to 27th May, 2018) analysis can provide insights on the crucial planetary movements and its impact on your life. Stay tuned to Astroyogi’s expert astrologers for horoscope analysis. The sun remains in Taurus this week and you may still be scratching your head about your love life. As an earnest sign, you won’t wallow for long. Instead, you’ll try to fix the problem. Good communication will lead to the resolution you seek. Mercury remains in Aries and although your interest in spirituality has declined, your passion for music continues to grow. If you have started playing an instrument, you are improving but even if your interest doesn’t involve playing, you are still moved by music and it is important for you right now. On the 27th, Mercury moves into Taurus which calms your mind and invites you to spend more time with family and friends. The impact of Venus in Gemini keeps you securely bonded with the younger generation. You enjoy basking in the support, warmth and love of your family and feel full of joy and lightness. Try to avoid unnecessary or wasteful expenditure. Remember, the simple things, and often the most beautiful, are often free. Are you continuing to meditate, practice yoga and make time for relaxation? By relaxation, we don’t mean sleep, rather a more active means of quieting the mind such as exercise. Finding outlets that bring you into a state of flow will assist. Mercury moves into Taurus on the 27th and you will notice that your popularity is heightened. You may get more invites and find that people gravitate towards you. Your powerful ability to communicate earns you many friends. With the sun in Taurus, your self-confidence is higher than it has been for some time and this beautiful confidence enables you to chase your dreams. You are comfortable in your own skin and express yourself well. This resonates with other people who respond to your magnetic charm. There is a lightness to Gemini natives that is captivating. Your professional and personal lives are both ticking along in a satisfying manner, although you may feel restless and long to explore. This is something that you must make space for as travel and the need for movement is very much a part of the Gemini journey. You may draw a new romantic partner from the deck and there may be an age difference. This doesn’t matter to either of you, as the love you experience is real rather than exploitative. You continue to excel at work where you are expending a great deal of energy. Your output is tremendous, and you continue to impress all around you. If you are looking for a promotion, then this is certainly the way to go about it. Try to include calming practices into your daily life to offset your work. You are struck with a bolt of brilliance and get imaginative and creative at work. Introducing new ideas brings about real change. You feel calm and composed and are able to apply consistent focus ensuring that you get things done. Your love life is enjoyable, and you may feel like a teenager again as a new love affair continues to blossom beautifully. You have managed to abolish a sense of tension and anxiety that was hovering around you recently and are now focused firmly on the present and enjoying a shining sense of luck that turns everything you do into gold. You are more at peace with yourself and have greater focus and clarity on what the future has in store. If coupled, your life partner supports all that you do. If you feel stagnant, there are plenty of opportunities to do something new whether in your career, love life or in terms of your hobbies and projects. Never feel that you are stuck anywhere. Your expenses are low, and you are enjoying a financially excellent period. Keep squirrelling away money into your savings. Get the most accurate Daily, Weekly, Monthly and Yearly horoscopes on your Smart phone with Daily horoscope app by Astroyogi. Click here to download the app now! Health is wealth and you need to make sure that your health is your key priority. There are lots of little things that you can do; walk for 30 minutes every day, replace unhealthy snacks with good ones and take 10 minutes out of your schedule to meditate. These habits build with time and snowball into amazing results. Fortunately, towards the end of this month, you will begin to feel more like your normal self. At work, it is key that you focus and do your best. If anything distracts you from this, be conscious of it and think about you can mitigate the risks. Hold tight dear Virgo, you have not had an easy ride of it recently, but your fortunes are set to change. With the sun in Taurus, your interpersonal relationships may require some attention. There may be tension, conflict or misunderstanding between you. Try to communicate clearly. Resist the urge to bury the problems under the carpet. Stress can permeate every area of life so whilst trying to resolve this issue, ensure that you also learn to find a quiet and safe space where you can heal and prioritise self-care. This balance is ideal for Libra natives. Although your personal life may feel like a struggle, your professional life continues to improve. With Venus in Gemini, you can rest assured that luck is on its way to you, even if it doesn’t feel that way yet. Mentally you are in good shape right now. You feel clear and focused. You are in the midst of some kind of transformation and your life feels as though it’s about to change. Don’t fret, all of this change is positive. Your health will also be great, baring a few minor setbacks. Scorpio, your skin is a sensitive area so be aware of any allergies or intolerances. Also protect your skin when you are out in the elements. At work, things feel pleasant and conducive to a comfortable working environment. Whether you wish to change jobs or not, you probably feel quite happy where you are. With Venus in Gemini, you may worry about your partner. Try to do all that you can for them whilst also caring for yourself. Take time to be near large bodies of water, eat well, mediate and remember that privacy is a healing tool for you and that if you need to retreat to heal, you should do so. You have recently like fate is on your side, and it is, and this should be a comfort to you. Whatever you want to try will turn to gold. Self-development opportunities will enable you to flourish. You are so deeply attuned to your spiritual side, that you know exactly what to do for your own welfare. It is easy for you to be true to yourself, grow and inspire and encourage others. Roles of leadership will serve you well at the moment as you are trustworthy, kind and concerned for the greater good. Your intelligence continues to be a key asset for you and you may find a career in academia. Teaching is a great profession for you as you can impart your wisdom and you relate well to those younger than you. With Venus in Gemini, you will be a guiding light and supportive force for your partner. You are not always comfortable with change as you like to ascend slowly but surely. You can probably relate to the image of the mountain goat, who traverses the mountain step by step. In this sense, you feel in control of change as it appears as a goal that you are working towards conquering. Changes that seem to come from outside, curveballs we like to call them, can feel threatening to the path that you have picked. Change is not always bad. You need to be open to it, as it’s a natural part of life. Despite your hard work, you may not feel lucky, but luck is coming to you in its own time. With Venus in free-thinking Gemini, you may feel tense for the future. If a parent, these anxieties may manifest around your children. Perhaps they relate to being able to provide for your children. Remember, you can take action in the present to set your mind at ease. With the sun in Taurus, you switch into a highly proactive and productive mode of thinking. This is a time for taking action and doing and you are completely in the mood to go after your goals. There are plenty of new opportunities presenting themselves to you and you feel enthusiastic about the options life has given you. You really feel as though there is no possible wrong turn to take. All roads lead to paradise. This is a very freeing position to be in, because you can follow your heart without regret or self-doubt. Your new-found sense of fun brings you new friends and possible admirers, if you are single and wish to pursue them. Life is perfect, and you have found a way to live that fulfils your wildest dreams. If we can give you any advice, it would be to continue practices and habits that add to the happiness. This will keep your foundation strong. You start this week on a financially strong high. Money is no object. You also feel very confident and in the mood to get things started. This may manifest as wanting to change careers. Great options for Pisces natives are professions that involve spirituality, healing, service to others and the arts. You seem to have a natural affinity for these careers. You feel harmonious with relatives and you wish to travel with your partner so that you are able to make memories. With Mercury in Taurus, you may switch to a slightly lazier mode of being and feel unmotivated. It’s important that you learn to get yourself into gear in some way. Whatever motivates you or encourages you should be brought to the fore. The sense of accomplishment you will receive from achieving things, is one that can’t be beaten.